We’d love your help. Let us know what’s wrong with this preview of The Bet by Paul Sabin. To ask other readers questions about The Bet, please sign up. The Bet is a long-form book about one of my favorite economic bets in history. Paul Ehrlich, doomsday economist and author of The Population Bomb, spent a significant amount of time talking about overpopulation and its impact on resources. Simon, a little-known economist who disagreed, ended up challenging Ehrlich to a bet regarding the price of five metals a decade down the line. This quickly became one of the most famous bets in history. The book works in that it's a solid histo Closer to a 3.5. The book works in that it's a solid history of the men and the era. It provides solid starting points for the beliefs and mindsets of both men, and a good deal of context for the eras themselves. It's an extremely informative take on the economic and political environments of the era, which was a welcome detail. It is also even-handed in many regards - while it's deferential to Simon (and for good reason), it doesn't act as a hagiography and gives Ehrlich a much fairer shake than a more partisan take on the story might. The book is a miss in some regards as well, though, in that it's really overly padded with a lot of biographical information about both men that took away from the overall narrative. With as much detail thrown in, it becomes less about the bet and more about the personalities, which isn't what I was looking for as a reader. With so much extra, the book ended up being longer than it needed to be. "People ought to respect certain natural limits if we want to maintain a happy, healthy, and productive society. We can't just pollute the air endlessly or plunder the oceans freely. The good news, though, is that it's totally possible to make our modern way of life sustainable. No need to give us capitalism or economic growth. It's just that the free market alone won't get us there. We'll need regulations and other policy changes." This might sound banal today. But that whole outlook is actually a delicate compromise between two opposing positions on resource constraints that slugged it out in the 1970s and 1980s. Paul Sabin's The Bet is all about that fight, and it's a worthwhile story to rehash. One side, epitomized by biologist Paul Ehrlich, believed that humanity was breaking the carrying capacity of the Earth. The way to avoid mass starvation, energy shortages, and other apocalyptic meltdowns was to drastically reduce the world's population and radically constrain capitalism. This idea of "natural limits" was so influential it shaped Jimmy Carter's thinking. The other side, led by an initially obscure economist named Julian Simon, believed that human ingenuity would always allow us to overcome those natural limits. The more people, the better. If food became scarce we'd figure out how to grow more. If oil prices surged we'd develop alternatives. Trust the markets! Simon's work helped the guiding ethos of the early years of the Reagan administration. There's a good case to be made that Simon's side prevailed--and not because he won his famous bet with Ehrlich over the future price of commodities like copper and tin (that was more luck and good timing than anything). More to the point: The world's population soared from 3.7 billion in 1970 to 7 billion today and humanity didn't starve to death, as Ehrlich predicted. We adapted to energy constraints. Humans figured stuff out. But Simon wasn't always right, either. The free market couldn't solve every last problem on its own. The world would have been fried had the world's governments not banded together in the 1980s to ban CFCs and avert the shredding of the ozone layer. And the tragedy of the commons isn't something to shrug at. Ask Newfoundland what happened in the 1990s after the Atlantic cod population collapsed from overfishing. Even so, environmentalists have clearly altered their thinking and tone since Ehrlich's day--and Simon can claim some credit here. The main green groups nowadays don't tend to argue that capitalism is doomed. They don't imply that humans are a cancer on the verge of killing off the host. Environmentalists can be gloomy--particularly on climate change--but their warnings are often cast in terms of scientific probabilities and talk of "risk management." And market-based solutions like cap-and-trade or catch shares have become a key environmental tool. So where does that all leave us today? Sadly, Sabin doesn't even try to answer big questions like, "How much should we worry about modern-day environmental concerns, like global warming?" (After all, just because Ehrlich was wrong about doomsday doesn't mean climate scientists are wrong.) There's actually a ton of fascinating research currently being done on whether there are "planetary boundaries" that humans need to respect, but Sabin doesn't even touch on this work. This book felt like a New Yorker article, which would be a good thing, except it’s a book. Interesting, but heavy on the historical facts, people, etc. Read like a history text book. Dunno why it didn’t totally click as I love history and Econ. Needed to skim the second half to make it through. A good overview yet I was waiting for more science and less drama. Some say "history is the subject that teaches us that we do not learn from history". "The Bet" is a book that shows why it is important to know the history of the environmental movement in order to understand and avoid the mistakes that have led to the current assault on environmental institutions. Sabin describes quite entertainingly the lives of to academics on the opposite side of the spectrum, and how their well-meaning but ultimately uncompromising and flawed approaches to advocacy have hurt Some say "history is the subject that teaches us that we do not learn from history". "The Bet" is a book that shows why it is important to know the history of the environmental movement in order to understand and avoid the mistakes that have led to the current assault on environmental institutions. Sabin describes quite entertainingly the lives of to academics on the opposite side of the spectrum, and how their well-meaning but ultimately uncompromising and flawed approaches to advocacy have hurt the environmental movement substantially. It shows why scaremongering and doomsday-scenario painting may result in short-term gains, but ultimately may prove counterproductive for the cause of environmentalism. Out of scope of this book, but certainly of great interest, would have been a description of more positive approaches to environmentalism, and how they contrast with the approaches takes so far ("sustainability-fatigue"). All in all a great and entertaining book, which should be required reading for every sustainability professional. Easy to read through as a book that how Ehrlich and Simon shaped the concept of the environmental future in US. Today, obviously we admit that the overpopulation has played the biggest role of the shortage of nature resource. Simon's thought we need to count the natural resource of the whole universe as a whole, the problem is we can barely get out of our planet, let alone survive beyond. No doubt that we need to leave something to our next generations before it's too late. I don't think the majori Easy to read through as a book that how Ehrlich and Simon shaped the concept of the environmental future in US. The political debate about the future of the planet rests upon assumptions inherited from the last quarter of the twentieth century championed by Paul Ehrlich and Julian Simon. This is a tidy history of that debate and the damage it has wrought on conforming the economy to ecology. Explains why both extreme environmentalists and free-market extremists sound crazy, how we got here, and why it's so hard to make any meaningful progress. A fine read if you're interested in Environmental History, particularly the conversation around population growth and responses to it that gained national attention in the 60's and 70's. The debate over environmental responsibility replays again & again, seemingly on a 40 year loop. Even-handed treatment of the famous bet between Paul Ehrlich and Julian Simon. Sabin bemoans the political divide that The Bet represents but, in the end, concedes that Simon was right. 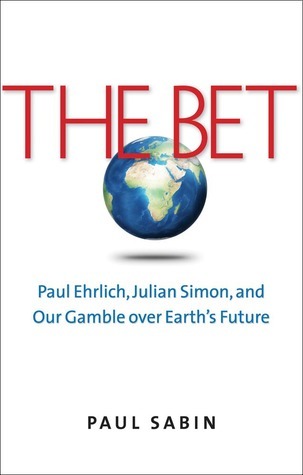 The Bet (2013) by Paul Sabin is a really fine book that looks at the different beliefs of the ecologist and author of The Population Bomb Paul Ehrlich and the economist Julian Simon and their famous bet on the price of natural resources. Sabin is an academic at Yale who teaches environmental history. He introduces the book by describing his own environmentalism which is a very honest and clear way of clarifying his own biases. The book then looks at Paul Ehrlich’s rise to fame as a prophet of doom The Bet (2013) by Paul Sabin is a really fine book that looks at the different beliefs of the ecologist and author of The Population Bomb Paul Ehrlich and the economist Julian Simon and their famous bet on the price of natural resources. The book then looks at Paul Ehrlich’s rise to fame as a prophet of doom. Ehrlich’s childhood, career as a butterfly biologist and his rise a ecological activist is catalogued. Ehrlich’s book ‘The Population Bomb’ and his series of dire predictions and rise to fame in the 1960s and 1970s is described with insight. Sabin then looks at Julian Simon’s childhood and career. Interestingly both Simon and Ehrlich grew up in suburban New Jersey to upwardly mobile Jewish parents. Simon went to Harvard then obtained an MBA and then a PhD at the University of Chicago. Simon initially worked on using marketing to reduce population growth but then investigated the assumption that increased population was a problem and came to the opposite conclusion. Next the rise of environmentalism in the 1970s is described. The creation of the Environmental Protection Agency by Richard Nixon and the passage of various other laws and the rise of Jimmy Carter and his own environmental beliefs along with the oil crisis are discussed. The book then gets to the famous bet between Simon and Ehrlich where Simon challenged Ehrlich to pick 5 metals that he thought would rise over the next decade. Ehrlich comprehensively lost the bet after declaring that taking up the bet would be easily getting free money. The Reagan presidency and Reagan ‘s scepticism of the benefits of further environmental regulation is summarised. Sabin also points out that while the general thrust of the Carter was toward environmentalism and Reagan toward the market that Carter deregulated the energy industry substantially and Reagan signed on to the Montreal Protocol to reduce CFCs. Then the increasing polarization of environmental debates between pro-market optimists and environmental catastrophists is nicely described. The contribution of Bjorn Lomborg in fact checking the debate, coming out generally on Simon’s side and then being demonised by environmentalists is added to the discussion. Despite being substantially wrong Ehrlich was far more successful in winning prizes and notoriety than Simon. Sabin concludes the book by praising the contributions of both Ehrlich and Simon while pointing out that Ehrlich was categorically wrong. He credits Ehrlich with allowing increasing environmental regulations to be passed while crediting Simon with pointing out that the price mechanism and human ingenuity have shown Malthusians to be wrong for the past 200 years. Sabin would like to see more of a fusion between the two positions. It’s an excellent book that both environmentalists and others will enjoy and get a lot from. Sabin has done an excellent job in writing a very readable, interesting book. I think Sabin did a good job of maintaining neutrality toward Simon and Ehrlich throughout the novel. Additionally, he didn't really present his personal views on the topic until the final chapter. As a historian, I think he did a fairly good job of telling Simon, Erhlich and the bet's history. However, I had to force myself to keep reading. For some reason, I just found his style and writing to be like the worst of boring textbooks. I do agree with some of his final points, especially that Ehrl I think Sabin did a good job of maintaining neutrality toward Simon and Ehrlich throughout the novel. Additionally, he didn't really present his personal views on the topic until the final chapter. As a historian, I think he did a fairly good job of telling Simon, Erhlich and the bet's history. However, I had to force myself to keep reading. For some reason, I just found his style and writing to be like the worst of boring textbooks. I do agree with some of his final points, especially that Ehrlich, "by repeatedly crying wolf, he has played into the hands of those who consider environmentalism a lunatic movement." -"All told, the Ehrlichs received more than a million dollars in prize money during the 1990s"
-"By contrast...his [Simon's] salary... adjusted for inflation, his salary diminished in value, faring slightly worse than average faculty salaries during this period [1988-1997]." This is nicely written book on an importgant topic: does nature put limites on economic growth? Although the actual growth debate was/is much wider, the framing of this as a debate between Ehrlich and Simon works well. It culiminates in the bet about the price increase of 10 metals/minerals. Simon won the debate, basically because he was lucky with the decade they picked. This book is also an insightsful story about how public debates often become polarized and eventually also not very informati This is nicely written book on an importgant topic: does nature put limites on economic growth? Although the actual growth debate was/is much wider, the framing of this as a debate between Ehrlich and Simon works well. It culiminates in the bet about the price increase of 10 metals/minerals. Simon won the debate, basically because he was lucky with the decade they picked. This book is also an insightsful story about how public debates often become polarized and eventually also not very informative when both sides start exaggerating their arguments to the extent that none of them can be right. The Bet is also a story on how the passonate engagement in a fierce public debate changes your personality (for the worse). Relatively evenhanded look at the environmental debates in this country over the past 50 years. The author is Yale professor Paul Sabin, wife of abortion zombie Emily Bazelon, and his bias comes out from time to time. Nevertheless, he is willing time and again to demonstrate how free-market capitalists have been right far more over the past 50 years than Chicken Little environmentalists. The book's namesake bet was a wager between the two gentlemen in the subtitle who waged $1000 dollars on a bas Relatively evenhanded look at the environmental debates in this country over the past 50 years. The author is Yale professor Paul Sabin, wife of abortion zombie Emily Bazelon, and his bias comes out from time to time. Nevertheless, he is willing time and again to demonstrate how free-market capitalists have been right far more over the past 50 years than Chicken Little environmentalists. The book's namesake bet was a wager between the two gentlemen in the subtitle who waged $1000 dollars on a basket of 5 commodities in 1980. Ehrlich thought the price of the basket would go up in 10 years; Simon, the sane one, thought it would decrease. He was right, to a tune of over 50%. If you want to understand the modern climate change debate, read this book. It presents two of the sides of the argument and demonstrates why each has limitations both ideologically and due to the figures leading those various ideological groups. It does this in a way that is an interesting narrative and doesn't ignore factors like media attention and attention paid by policy makers, which are a significant factor in this debate. It's also fairly concise and does a good job of sticking to the su If you want to understand the modern climate change debate, read this book. It presents two of the sides of the argument and demonstrates why each has limitations both ideologically and due to the figures leading those various ideological groups. It does this in a way that is an interesting narrative and doesn't ignore factors like media attention and attention paid by policy makers, which are a significant factor in this debate. It's also fairly concise and does a good job of sticking to the subject at hand, while realizing that the influences on the two main figures were many. I enjoyed this mid-length book immensely. It is a solid overview of Ehrlich's rise to prominence and Simon's retort, both of their intellectual stories behind the famous wager are wrapped in the political clashes of Carter and Regan, which provide a mainstream dressing and embellishment of the core assumptions and ideas of the two men. The author is, in my view, very even handed in sketching out the history of these two men and the wider political clashes, although it did seem to me (as a bit of I enjoyed this mid-length book immensely. It is a solid overview of Ehrlich's rise to prominence and Simon's retort, both of their intellectual stories behind the famous wager are wrapped in the political clashes of Carter and Regan, which provide a mainstream dressing and embellishment of the core assumptions and ideas of the two men. The author is, in my view, very even handed in sketching out the history of these two men and the wider political clashes, although it did seem to me (as a bit of a Simon fan) that Simon gets a better hearing, but that might be to do with how catastrophically poor Ehrlich's predictions and assumptions were/are. All in all a great and enjoyable account of the clash between the world famous Ehrlich and the lesser known rival Simon and their bet over the price of 5 metals in the decade of the 1980s. very vanilla introduction to the ehrlich-simon debates. limited value over a long article or author interview (sabin's econtalks interview is very good). well constructed and easy to read. 1 - ehrlich was wrong, but the main determinant of the bet was standard macro-economic fluctuations. 2 - 1970's environmentalists were pretty offensive in disregard for human life, and some modern right wing radicalism can be understood as responding to the left-wing population control radicali very vanilla introduction to the ehrlich-simon debates. 2 - 1970's environmentalists were pretty offensive in disregard for human life, and some modern right wing radicalism can be understood as responding to the left-wing population control radicalism of that time. 3 - theres not that much evidence (at least in this book) that public intellectual debates of this kind were determinative of public policy. This book illustrates both sides of an environmental debate that at its heart centers around 1) whether increased population in is a good thing, 2) how adaptable humans are to constrained resources, and 3) at what point our resources will give out in the face of population growth. Really good points made by both sides, but frustrating that their polarization and dogmatism didn't allow them to combine these concepts in meaningful ways. The Bet and Climate of Crisis both provide comprehensive histories of US environmental laws and policy. Both authors bend over backwards to be fair and balanced. Allitt leans slightly right and Sabin slightly left, but both make the same fundamental points. Both are excellent reading for people trying to understand why environmental policy issues can be so contentious, and why we aren't making more progress on climate change. An object lesson on the antifragility of punditry under conditions of consistent bias (in the statistical sense) towards extreme inaccuracy in prediction (Ehrlich). Sabin does a reasonable job of balancing (and contextualizing) the subject matter; unfortunately, he also fails to resist the historian's trap of relativizing the issues without providing a factual standard for judging the issue on the part of his readers. Well worth reading for young and old alike. The transformation of the "environment vs. economy" debate into, well, just that, a debate that has to have "winners" and "losers" is well worth the history lesson (for younger readers) and the review (for older ones.. like me..) It's only drawback is its short length.. but then, that's sort of its strength, too. Good for general readers, but worthy of serious readers, too. One of those rare cases where the podcast interview with the author is better than the book. I recall some of the debate on over-population when I was a kid but I never knew its origin. Ehrlich is an a$$hole as far as I'm concerned and Simon was a sellout to big business. Neither are heroes in my view. Very well-written & readable explication of historical environmental divides through a biographic lens. I quibble with some of the emphases & glossed over detail, but the book doesn't suffer from the myopia that plagues lots of environmental titles—that's practically worthy of a 5-star rating all by itself! I'm another one who would have given it 3.5 if I could. Sabin gives us Ehrlich and Simon as progenitors of the kind of corrosive debate that continues to cripple us today. I'm recommending it to all of my friends on both sides the some of the seemingly intractable issues, climate chief among them, as kind of a cautionary tale. Although I had lived through much of the timeframe of this book, I was too young to understand the dynamics of the scholarly debates on the environment and the free market that were transpiring. I found it really helpful to flesh out the details with this text. And how this provided the framework for where we find ourselves today on issues of the environment vs. growth was really interesting. I thought this book was good. It explores the "environment vs. economy" debate and helps us understand many of the driving forces behind said debate. It's a lesson for younger readers and for older readers, like myself, it is well worth the debate. It could have been longer, but all in all, I did enjoy reading this book and will be recommending it to some friends. Paul Sabin teaches American history at Yale University. He is the author of THE BET: PAUL EHRLICH, JULIAN SIMON AND OUR GAMBLE OVER EARTH'S FUTURE (2013), and CRUDE POLITICS: THE CALIFORNIA OIL MARKET, 1900-1940 (2005). Before joining the Yale faculty, Paul served as founding executive director of the non-profit Environmental Leadership Program. He is a graduate of Yale College and the University Paul Sabin teaches American history at Yale University. He is the author of THE BET: PAUL EHRLICH, JULIAN SIMON AND OUR GAMBLE OVER EARTH'S FUTURE (2013), and CRUDE POLITICS: THE CALIFORNIA OIL MARKET, 1900-1940 (2005). Before joining the Yale faculty, Paul served as founding executive director of the non-profit Environmental Leadership Program. He is a graduate of Yale College and the University of California, Berkeley.